#ThinkDifferent. Grass Fields CAN Take More! Growing Green Grass is dedicated to the possibilities of natural grass fields. Grass fields CAN take more use! The foundation for these possibilities of positive thinking. Positive thinking encourages creativity and fuels the mind to Think Different about what is possible…. As children, we are encouraged to set goals for our lives and to “dream big”. Walt Disney fills our lives with positive influence and encouraging quotes…. Impossible. As children, we are taught that nothing is impossible. Then as we grew into teens, somewhere that spirit was lost. The push of encouragement and confidence was replaced with “life lessons” and a “dose of reality”. We can’t be little kid dreamers forever right? And reality says so many things really are impossible. Have you ever asked yourself when that change in life happened? Who is it that got to decide what IS and is NOT possible? Christopher Columbus didn’t get the impossible memo. Nether did Alexander Graham Bell. Or NASA. Or Steve Jobs. 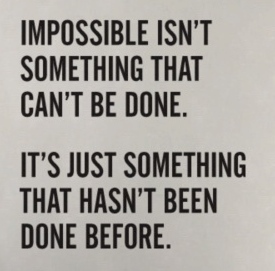 Impossible only fueled their work! Have you ever stopped and asked yourself the same question about natural grass fields? Why was it decide that it is impossible for natural grass fields to take high traffic? Why are there limits on the use natural grass fields can take? Where in time was it decide for us what IS and is NOT possible. In the childhood of grass field maintenance, the fore fathers of grass field management weren’t putting limits on how much a grass field could take. They simply were trying to create a safe smooth surface for the players. No large equipment. No advanced technology in fertilizer and plant genetics. No professional organizations to support them. Now, the industry is greatly advanced in professionalism and technology. It really is amazing! Stop and ask yourself… why is it IMPOSSIBLE for natural grass fields to meet the demands of high use? What if instead of focusing on WHY its impossible for grass fields to take high traffic, you asked HOW can grass fields take high traffic? Shed the boundaries created by someone else. Use technologies and your own creativity to use and evolve new maintenance methods to meet the demands. Can you bring back that positive thinking Disney spirit of “If you can dream it, you can do it“? Can you THINK DIFFERENT!? YES YOU CAN! Exciting isn’t it!?!? Nelson Mandela spent 27 years in prison before becoming President of South Africa in 1994. Mr. Mandela certainly knew that word IMPOSSIBLE. Yet one of his famous quotes is “It always seems impossible until its done”. Wow! SO TRUE! Our phones are computers in our pocket and men have walked on the moon. Creating natural grass fields that can take high traffic IS achievable. Grass fields CAN TAKE MORE! “A college student arrived a few minutes late for his final exam in mathematics. The room was quiet, with everyone working hard, and the professor silently handed him the test. It consisted of five math problems on the first page and two on the second. The student sat down and began to work. He solved the first five problems in half the time, but the two on the second page were tougher. Everyone else finished the exam and left, so the student was alone by the end of the time period. He finished the final problem at the last second. The student was able to answer them simply because he had not be told they were impossible. He himself decided what is or is not impossible. “Genius” is sometimes just not realizing that something is impossible. THINK DIFFERENT. GRASS FIELDS CAN TAKE MORE!